The PDF version of this best selling book comes in an A4 formatted 112 page document. You are free to read it on-line or print out all or any of the eight chapters. 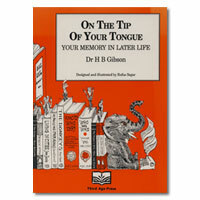 In ‘On the Tip of Your Tongue’ Dr Tony Gibson, begins by exploring the history of man’s interest in memory. He roams through Greek methods, stage hypnotism and the criminal courts, deals firmly with Freud and showcases many researchers. Some persistent myths are demolished on the way. This is the first book on memory written specifically for older people. It has been a best seller with Third Age Press since it was published twenty years ago but is now out of print as a print book (although you may find used copies online). It is entertaining as well as instructive and will help you manage your stock of memories as well as your life. Chapters include: What is memory? How is your memory changing? Dr Gibson advises you to seize the day as well as the decades ahead – whether you are a task oriented person or a lotus eater – and to keep your mind nimble until you eventually ‘fall off your perch’. Tony Gibson’s career as an academic and psychologist spanned over 50 years and this book, written in with eightieth year encompasses an accumulation of enduring wisdom. He has also been a prolific author, writing widely on various psychological areas as well as on life in the third age.